Three years in the making, Henry St is a collection of sophisticated alt pop tracks which ooze musical prowess and signal an emotional maturity beyond this Auckland four-piece band's years. Gathering together both old songs and new, the 12 track release, recorded over 15 summer days at The Lab in Auckland with producer Jol Mulholland, celebrates the universal themes of love, loss, and confusion - turning pain into emotive anthems at every turn. While Alae have grown from a two piece to four over those 3 years, Henry St conveys a timeless sound and remains a testament to Alex Farrell-Davey's prolific songwriting and his enduring partnership with Allister Meffan. "The album is centered around personal growth and evolution. It's about empathy, sympathy, apathy and all the grey in between", says Alex "It's a body of work that we hope comes across as emotionally sincere and relatable - but an album's meaning can really only exist in the mind of the listener. We've spent so long creating the album that it feels like the process is over now - while for everyone else, it's just begun." 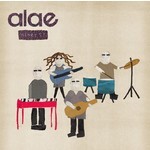 Adding to Allister Meffan's background in both classical and jazz piano, there was an undeniable opportunity to expand Alae's musical repertoire further with bassist Marika Hodgson and drummer Jayden Lee's addition to the Alae fold. "Having Jayden and Marika to add life to the band aspect had changed our sound completely. New life got brought back into songs we'd left unfinished and we were able to make the album as cohesive as possible, writing new songs to fit in places where it didn't flow. We're really stoked with the finished product", Allister states. Along with the singles Too Strung Up, Stone Cold and All Gived Up - which have amassed over 3 million streams across Spotify and have received premieres through international music stalwarts Billboard and Rolling Stone - Henry St contains a further 9 brand new tracks.